What is design patterns ? Have you used any design pattern in your code ? Design patterns are tried and tested way to solve particular design issues by various programmers in the world. Design patterns are extension of code reuse. Can you name few design patterns used in standard JDK library? Factory pattern which is used along with various Immutable classes likes Boolean e.g. Boolean.valueOf. Observer pattern which is used in Swing and many event listener frameworks. What is Singleton design pattern in Java ? write code for thread-safe singleton in Java. Singleton pattern focus on sharing of expensive object in whole system. Only one instance of a particular class is maintained in whole application which is shared by all modules. Java.lang.Runtime is a classical example of Singleton design pattern. From Java 5 onwards you can use enum to thread-safe singleton. What is MVC design pattern ? Give one example of MVC design pattern ? Model-view-controller (MVC) is a pattern used to isolate business logic from the user interface. Using MVC, the Model represents the information (the data) of the application and the business rules used to manipulate the data, the View corresponds to elements of the user interface such as text, checkbox items, and so forth, and the Controller manages details involving the communication between the model and view. The controller handles user actions such as keystrokes and mouse movements and pipes them into the model or view as required. MVC is often seen in web applications, where the view is the actual HTML page, and the controller is the code that gathers dynamic data and generates the content within the HTML. Finally, the model is represented by the actual content, usually stored in a database or XML files, and the business rules that transform that content based on user actions. Struts frame work follows MVC. caliculator design cane be one example of MVC. Adapter design pattern ? 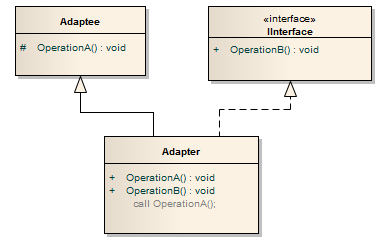 Give examples of adapter design pattern in Java? 0 comments to "Design pattern interview questions"